Joining UpThe PersonnelFolkestoneOstende Journey to AntwerpWelcome. The Grammar SchoolSettling InThe Rush of WoundedKind NeighboursHard WorkMalinesThe FortificationsWinston ChurchillRumours"Ragtime"The Cafés. Fall of WalaemThe Water SupplyThe Last BoatTwenty-Four Hours' NoticeMidnightRemovalIn the CellarsNext MorningThe Faithful CookThe TommiesThe Gas FailsLondon BusesThe First ConvoyCard-HousesPet Dogs "Bombe"Howitzers. More BusesPacking in the PatientsThe PassengersDown the Valley of FlamesThe Wait at the BridgeThe Highway of SorrowSt. Nicolas The WarningThe Track in the DunesThe Constant QuestionAgonyDeathAnxietyThe B. E. F.
ArrivalDisposal of PatientsThe SearchFound! Breakfast. More B. E. FHope and ActivityThe JoyRide The Croix-RougeTwo A. M.FlightPhilip Gibbs. A Cold ReceptionAt Work AgainThe Patients La Plage HotelResponsibility. Tuesday NightMidnight VisitorsHalt, Lame and BlindThe Garde CiviqueFugitivesThe WarningCommandeering SteamersThe Man Who Never CameGood-bye BombePanicTragedyThe TransportOld FriendsThe Ambulance TrainDoverLondon AgainThe DispersalGood-bye. The TelegramSt. MaloA Lively ReceptionL'Ecole EpiscopaleThe New StaffOur OrderliesThe Old-World TownSeeing LifeThe Munro Ambulance CorpsOur ChefThe Kitchen The Dining-HallThe MenuDarknessThe RushMiss McNaughtonFurnes StationThe Soup-KitchenThe Midnight Ambulance-TrainA Sabbath Day's JourneyThe Versatile ParsonThe RushThe Battle of the YserTaubesFlight! PoperingheThe BritishThe CuirassiersThe Convent RefugeFrench TroopsThe Horrors of War. X - FIRING THE "SOIXANTEQUINZE"
From the Ends of the EarthTwo Brave EnglishmenThe French 75The Trench Dressing-StationThe Belgian SoldierHomelessBereavedDesolateThe Suspense That KillsThe Operation TheatreAt Work and PlayThe Barber's ShopThe Sitting Room. Visit to DunkerqueXmas ShoppingHotter and HotterOptimist v. PessimistChristmas TreesThe Christmas SacramentThe Huns' Christmas CardsHide and SeekMistletoeAn Interruption to the Christmas FeastThe AftermathChristmas NightThe Orphans' Party. In the Cellars AgainThe Underground TheatreThe Shell That ArrivedAn Unhealthy SpotThe Shell That KilledFlightThe WidowThe Stowaway. The AlmsHouseThe AtticBedroomMudThe FarmyardA Patriotic ChefFour Heroes, Joseph, Eugene, Ernst Handschutter, Jean Lassoux, V. C., Hero and PoetWinter PassesDaffodilsSpring. 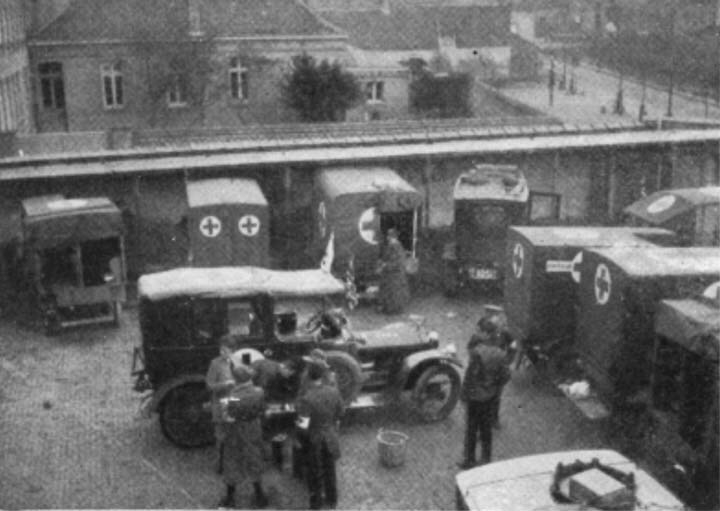 April, 1915Albert, the OrderlyThe Spring OffensiveHospital, a ShamblesTheatre, a Slaughter HouseThe StretchersGas ShellsUnderstaffedOver-WorkedBelgian Surgeons. The HutsThe X-Ray DepartmentMadame CurieSummer HeatThe TentAirPlanesRespiratorsOur GardenThe BandEntertainmentsThe Captive BalloonThe Barn Theatre Horse-RidingThe Premier GuidesBrayDune A JoyRideThe Picture-GalleryGarden BanquetsThe Blue CrossMore RidingOut of BoundsThe Officers' WardMoonlight MealsThe Street That Is Called StraightThe Crosses in the HarvestFieldVisits from the King and QueenThe CanadiansThe GeneralThe General's RoomGeneral JoffreKing AlbertThe Victoria CrossBlackberrying in FlandersA Country War PictureThe OrchestraThe Great WarriorThe Curtain Drops. Attached to us was a most interesting body of people, "The Munro Ambulance Corps." Dr. Munro was its chief. He is now Sir Hector Munro. With him, driving ambulances, were many well. 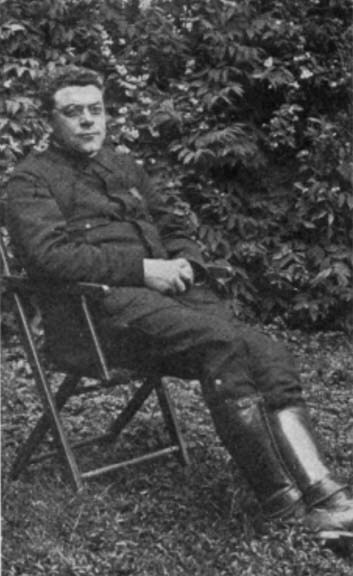 known people; just a few names I remember---Lady Dorothy Feilding, the eldest son of General Melisse, head of the Belgian R. A. M. C., Dr. Jellett, the Dublin gynæcologist; Claude and Alice Askew, the novelists (since drowned in a submarine attack); Miss McNaughton, authoress; Mrs. Knocker and Miss Chisholme; Mr. Hunt of Yokohama and Mr. Sekkar, a great sport and our good friend. All their ambulances were stored in our front yard, numbering over twenty. With them were four jolly young gentlemen-amateur chauffeurs who soon became our friends. These people worked mostly at night, gathering the wounded and removing them under cover of darkness. We received all those who could not travel further into France. Our dining-room was great! It was really the kitchen. A big stove covered with immense pots occupied one side. In front of it stood our chef, an ex-patient named Maurice. He was the sunniest fellow I ever met. He came in with the first batch of Furnes wounded, shot through the throat. When he laughed it sounded like a tin whistle blown by an amateur. He had been a cook, and when he was well the Queen gave him to us as chef. He wore a baker's cap and apron, presiding at all the festivities. 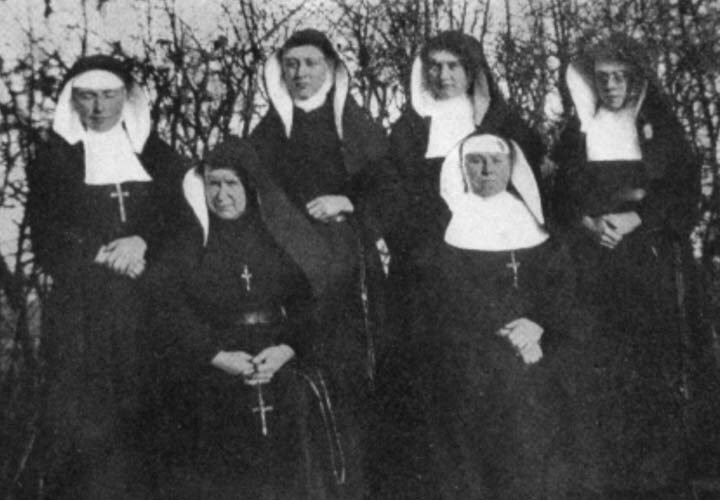 Under him were seven refugee nuns in voluminous black dresses and white caps like airplanes. They peeled potatoes and washed dishes. There were three trestle-tables covered with check oilcloth; we each helped ourselves to an enamel pint-mug, lead spoon and fork, and taking a bowl to the stove it was filled with coffee, soup or "bullybeef." For several weeks we lived on that stand-by of our Tommies. Disguise it as you will, in pie, rissole or curry, hide it under all the Parisian names you can find in a French cookery-book, at the first taste it just jumps up and shouts "Here we are again!" The other three articles which comprised our menu were coarse, wet, black bread, rancid butter from the Tommies' rations, and a dainty which resembled a bath-room-tile in size, shape and consistency, and which I firmly believe was Spratt's Dog Biscuits! We all sat together at these crowded tables, lords and ladies, chauffeurs, doctors and nurses. Once even, later on, we gave a dinner party, our guest being no less a personage than a Royal Prince of England. After the sun set the most impressive feature in Furnes was the darkness. Every house was shrouded in gloom. The streets were black. Our hospital was invisible except for a glimmering candle or cheap, evil-smelling lamp here and there. Never shall I forget that first night! The Battle of the Yser had just begun, and before we had got settled we were inundated with stretchers laden with groaning, bleeding men. By a guttering candle we examined their wounds. My friend and I, with two new Sisters, were in charge of a large ward, one of the big class-rooms. We were awfully short of all the appliances we consider indispensable to a hospital. Many of our beds consisted of sacking filled with straw or shavings. We rarely had a sheet and no mackintoshes in those early days. Stretchers lay all over the floor with men who were covered with mud and blood. In our ward there was a little elderly lady who quietly offered her services, and as she looked capable I sent her to clear away the evening meal and wipe down the tables. She never bothered me again but quietly busied herself setting things in order. Soon two big oil-lamps relieved the darkness and some large scissors that we had longed for lay to hand to rip the men's clothes off them. The unassuming little helper had been out to buy them. A few days after, when we had time to breathe, we were introduced. 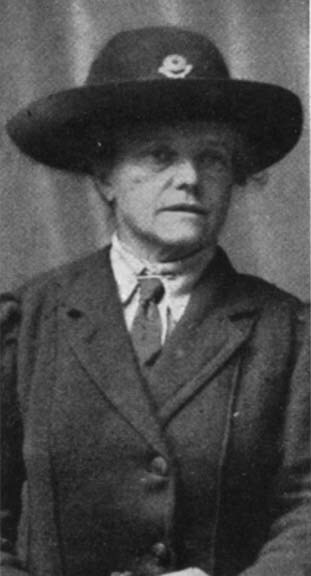 It was Miss McNaughton, the writer of "A Lame Dog's Diary" and other books. She stayed with us several days helping in our ward. After that she procured a tiny room at the station and ran a soup-kitchen for the wounded. Now, this sounds a homely and commonplace sort of occupation, but when you realize the circumstances you will know what courage it required. As I said before, Furnes was the Army Headquarters. King Albert spent most of his time there, and it was filled with military. Also Furnes station was the junction for all the little local railways that ran out to villages and towns at the Front, now so well known to all of us. One constantly heard the guard shouting "Poelcappelle!" "Nieuport!" "Dixmude!" and many other names mentioned constantly in our present offensive. All the fresh troops and ammunition passed through here; all the wounded returned through here at night. Therefore Furnes, with the station as the bullseye of the target, was the constant centre of attention of the German artillery and airplanes. Miss McNaughton was in the thick of it. She was a delicate little woman, highly strung and nervous, therefore it was particularly courageous of her to spend most of her time there peeling vegetables and stoking up furnaces. Often during that late autumn and winter when we had finished work we would take an after-supper walk to her tiny kitchen, a merry party of us. Sitting on sacks of potatoes and onions we would give her a hand preparing the midnight soup. Then, when the long ambulance trains shunted in at twelve, we would sally forth with trays of steaming mugs filled with hot soup and coffee, and, boarding the trains, give the eager sufferers on the stretchers a good hot drink to warm them up. Several shells hit the station. Once, when the collector was clipping tickets, his clipper was knocked out of his hand and his thumb blown off, whilst a thick pocket book over his heart saved his life, a piece of shrapnel being embedded in it. After Christmas, Miss McNaughton moved to La Panne. That was when Furnes had grown too unhealthy for human beings. We spent a happy Sunday with her at her villa, where she was writing a book about her experiences. 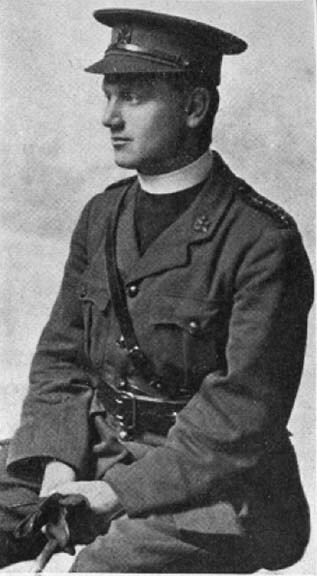 A young clergyman, who was one of our chauffeurs, went over to take a service at La Panne Hospital, so, as we three were all Miss McNaughton's friends, he took us along. We had quite an exciting time, coming home along the Ypres-Furnes Road. A Taube, spotting the Red Cross on top, thought he had some wounded to kill, so he followed us for miles, dropping shrapnel. It was great fun! I looked longingly at the fragments falling all over the road, but could not prevail on the parson to pull up whilst we gathered a few bits for presents to our home people. That clergyman was a great sport. He was not like a parson at all. Not only was he a chauffeur, but he was a Boy Scout troop commander and a skilled engineer and carpenter. We nurses were constantly indebted to him for shelves, stools, cosy corners, and other useful ward-furniture made out of old sugar cases, etc., in his spare time. The following spring while he was waiting for a batch of wounded at a dressing station, he used to go out into the fields and pick us nosegays of cowslips till bullets whistling through his hair made him realize that "discretion was the better part of valour." That young man afterwards went with General Townsend to the Relief of Kut, and was promoted a Captain. The Turks sent a bullet through his head, but after a few months' convalescence in India he is back at his post again, "Somewhere." The reader must excuse all these excursions on to side-tracks. The fact is, nothing in our life was consecutive at Furnes, or later at Hoogestadt. It was just a series of pictures made up of interesting events and people.